The index opened flat to negative but saw huge buying interest from the morning itself making newer highs with each hour to close near the top of the day at 7563.55, huge gain of 138.90 points. The broader market was also strong with 1021 advances to 541 declines. The range stays at 7200-7600. 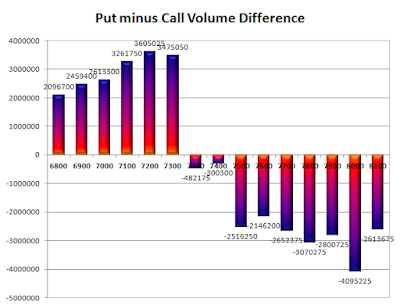 Call option 7500-8100 added huge 32.61 lacs OI with short covering seen at 7300 strike price. 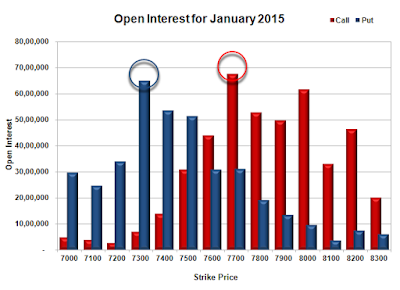 Put option 7600-6800 added huge 46.83 lacs OI with small short covering seen at 7800 and above strike prices. 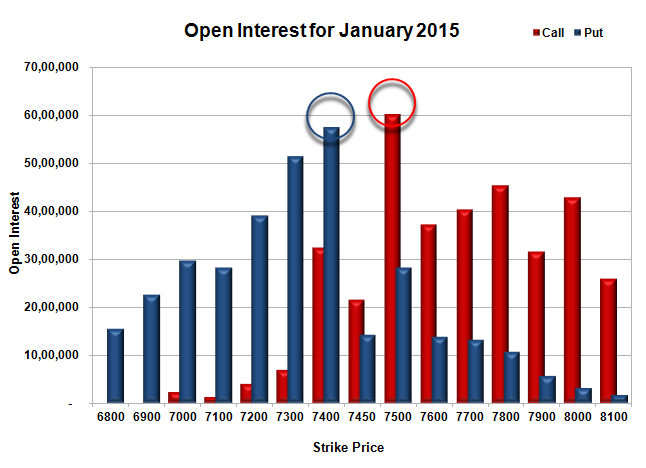 Nifty Open Interest is at 1,93,75,575 up by 5,47,725, with increase in price, most probably huge long build-up. 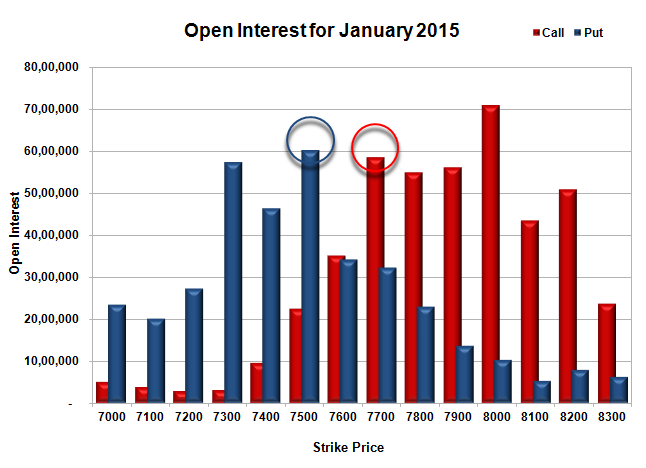 Bank Nifty Open Interest is at 21,24,480 up by 18,780, with increase in price, most probably long build-up. FII’s bought 5.98 lacs Futures, which includes net 20495 contracts long build-up and 3432 contracts short covering, with increase in net OI by 17063 contracts, includes 53481 longs to 29554 shorts for the day. FII’s Index future open contract as on date is 81189 Longs to 132073 Shorts, Net (-)50884 up by 23927 contracts. Initial support at 7500, with huge OI addition of 8.08 lacs and below that at 7400 with highest OI of 43.70 lacs. 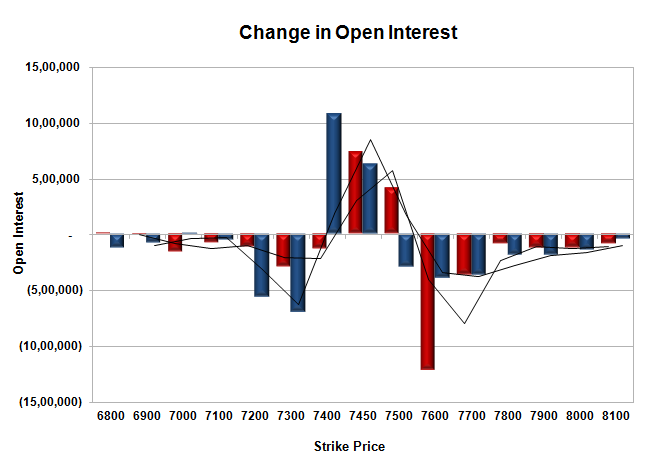 Initial resistance at 7600, with OI of 36.47 lacs and above that at 7700 with OI of 32.86 lacs. 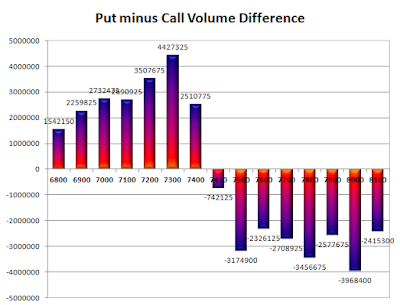 Day Range as per Option Table is 7441 - 7612 and as per VIX is 7495 - 7632 with 7434 as the Pivot. The index opened flat to negative and stayed in a narrow range for the better part of day, with strong selling in the later half to close near the lows at 7424.65, loss of 13.10 points. The broader market was negative with 730 advances to 805 declines. The range at the start of series comes to 7200-7600. 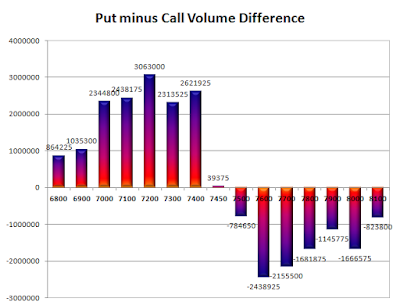 Call option 7000-8100 added huge 47.89 lacs OI. Put option 8000-6800 added huge 52.29 lacs OI. Nifty Open Interest is at 1,88,27,850 up by 39,29,775, with small decrease in price, mostly roll-over with small long liquidation. 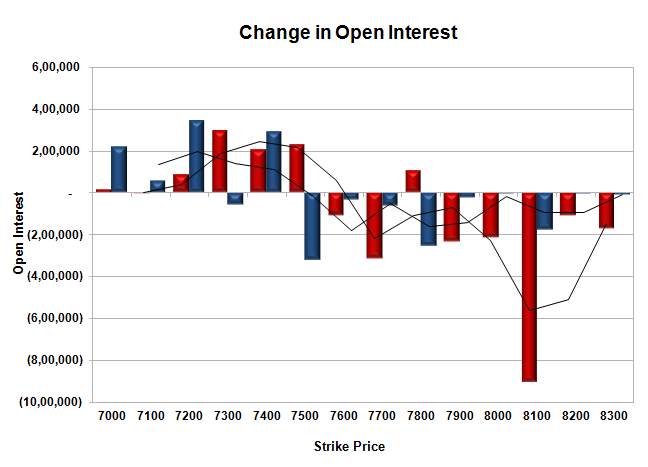 Bank Nifty Open Interest is at 21,05,700 up by 7,90,350, with decrease in price, 100% roll-over with huge short build-up. FII’s sold 7.41 lacs Futures, which includes net 103352 contracts long liquidation and 57774 contracts short covering, with decrease in net OI by 161126 contracts, includes 63330 longs to 92963 shorts for the day. FII’s Index future open contract as on date is 60694 Longs to 103352 Shorts, Net (-)74811 down by 45578 contracts. Initial support at 7400, with OI of 32.41 lacs and below that at 7200 with OI of 32.78 lacs. Initial resistance at 7500, with OI of 32.18 lacs and above that at 7600 with OI of 30.97 lacs. 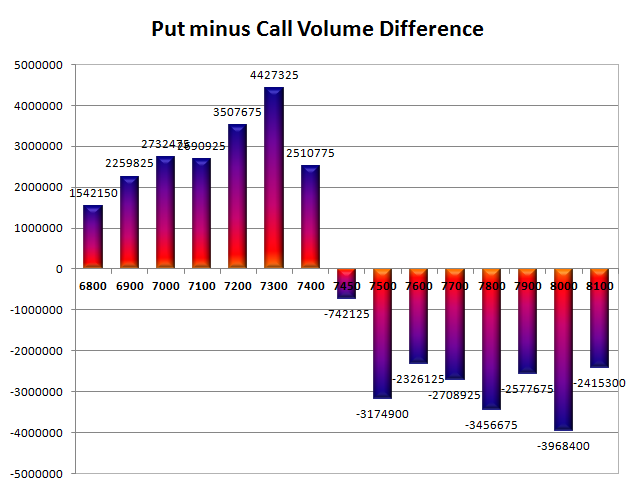 Day Range as per Option Table is 7352 - 7512 and as per VIX is 7355 - 7494 with 7434 as the Pivot. The index opened strong but went down within minutes to touch the lows of the day at 7420. Intermittent buying and selling saw the index in a narrow range and closed flat at 7437.75, gain of 1.60 points. The broader market was positive with 842 advances to 697 declines. The range for the week till expiry comes to 7300-7500. 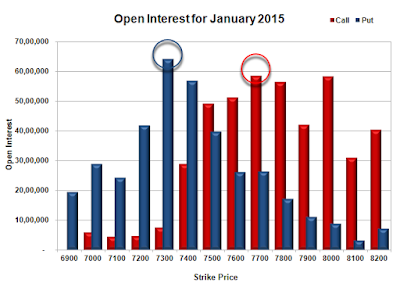 Call option 7450-7500 added 11.52 lacs OI with profit booking seen at 7600 and above strike prices. Put option 7450-7400 added 17.11 lacs OI with profit booking seen at 7300 and below strike prices. Nifty Open Interest is at 1,22,15,6625 down by 29,89,275, whereas Feb series added 69.00 lacs with no change in price, 100% roll-over with huge short build-up. Bank Nifty Open Interest is at 14,60,070 down by 7,18,320, whereas Feb series added 6.63 lacs with no much change in price, mostly roll-over with small long liquidation. FII’s sold 2.93 lacs Futures, which includes net 17414 contracts long build-up and 29135 contracts short build-up, with increase in net OI by 46549 contracts, includes 141062 longs to 152783 shorts for the day. FII’s Index future open contract as on date is 164046 Longs to 193279 Shorts, Net (-)29233 down by 11721 contracts. 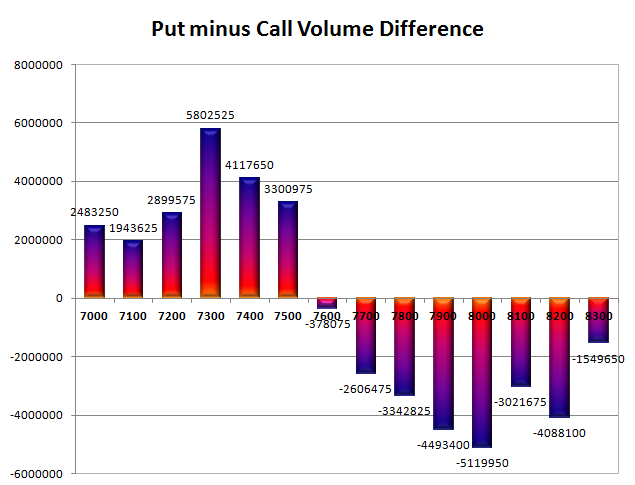 Initial super support at 7400, with OI of 57.48 lacs and below that at 7300 with OI of 51.34 lacs. Initial resistance at 7450, with huge OI addition of 7.38 lacs and above that at 7500 with highest OI of 60.10 lacs. 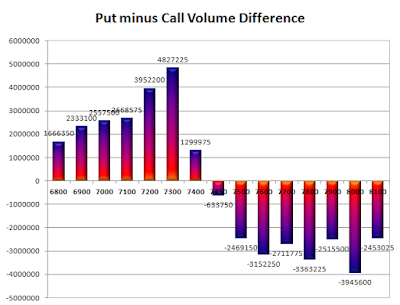 Day Range as per Option Table is 7358 - 7529 and as per VIX is 7364 - 7512 with 7445 as the Pivot. The index opened strong and went on to make a high of 7487 but saw selling pressure near the highs to close nearly flat at 7436.15, gain of 13.70 points. The broader market was also strong with 1059 advances to 517 declines. The range for the week till expiry comes to 7300-7600. 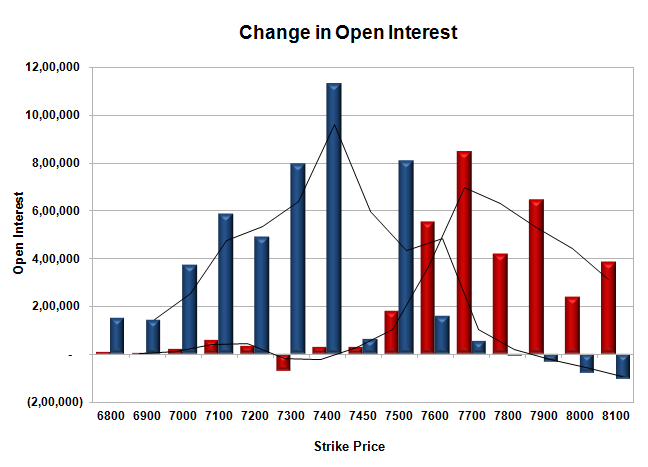 Call option 7450-7600 added huge 21.05 lacs OI with short covering seen at 7400 and below strike prices. Put option 7500-7450 added 3.97 lacs OI with profit booking seen at 7300 and below strike prices. Nifty Open Interest is at 1,52,04,900 down by 32,82,600, whereas Feb series added 31.77 lacs with increase in price, mostly rollover with small short covering. Bank Nifty Open Interest is at 21,78,390 down by 3,24,870, whereas Feb series added 3.06 lacs with increase in price, mostly roll-over with small short covering. FII’s sold 4.54 lacs Futures, which includes net 5702 contracts long liquidation and 12461 contracts short build-up, with increase in net OI by 6759 contracts, includes 86182 longs to 104345 shorts for the day. FII’s Index future open contract as on date is 146632 Longs to 164144 Shorts, Net (-)17512 down by 18163 contracts. 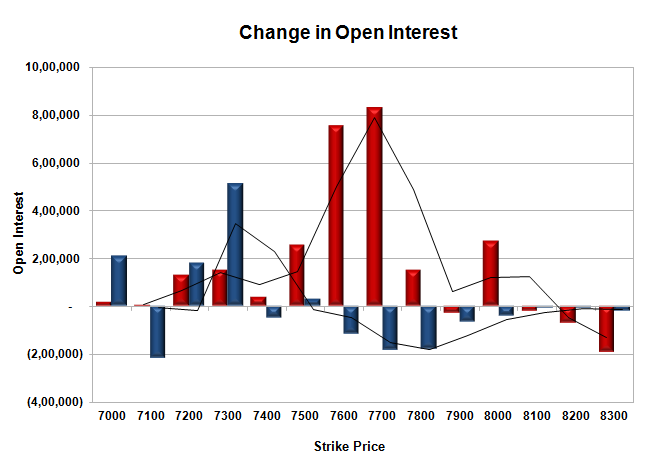 Initial support at 7400, with OI of 46.66 lacs and below that at 7300 with OI of 58.25 lacs. 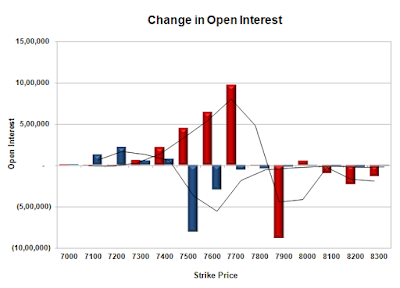 Initial resistance at 7450, with huge OI addition of 2.75 lacs and above that at 7500 with OI of 55.96 lacs. 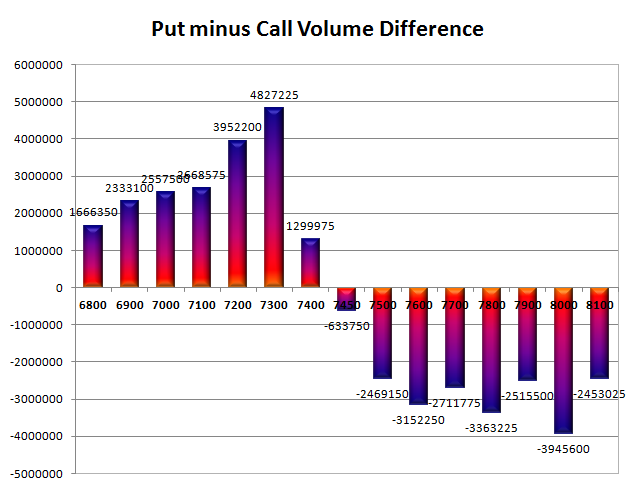 Day Range as per Option Table is 7352 - 7538 and as per VIX is 7365 - 7507 with 7448 as the Pivot. The index opened strong and stayed strong for the entire session of trade making newer highs with each passing hour to close near the highs of the day at 7422.45, huge gain of 145.65 points. The broader market was also strong with 1313 advances to 266 declines. The range for the series is now at 7300-7800. Call option 7450, 7800 added 7.59 lacs OI with short covering seen at 7400 and below strike prices. Put option 7450-7200 added huge 21.96 lacs OI with profit booking seen at 7100 and below strike prices. Nifty Open Interest is at 1,84,87,500 down by 10,63,800, whereas Feb series added 13.43 lacs with increase in price, probably 100% rollover with long build-up. Bank Nifty Open Interest is at 25,03,260 down by 3,10,110, whereas Feb series added 0.50 lacs with increase in price, probably huge short covering with small roll-over. FII’s bought 2.73 lacs Futures, which includes net 1292 contracts long liquidation and 12219 contracts short covering, with decrease in net OI by 13511 contracts, includes 75810 longs to 64883 shorts for the day. FII’s Index future open contract as on date is 152334 Longs to 151683 Shorts, Net 651 up by 10927 contracts. 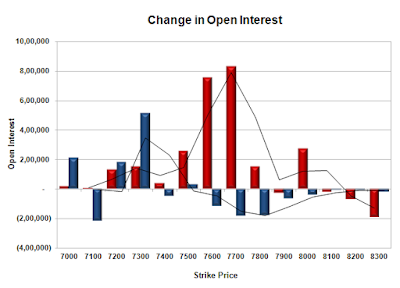 Initial support at 7400, with OI of 47.69 lacs and below that at 7300 with OI of 72.45 lacs. Initial resistance at 7450, with huge OI addition of 5.72 lacs and above that at 7500 with OI of 46.48 lacs. 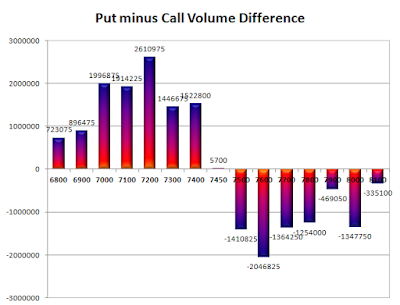 Day Range as per Option Table is 7302 - 7504 and as per VIX is 7349 - 7496 with 7394 as the Pivot. The index opened strong and went up to touch 7398.70 within the first few minutes but higher level selling saw the index close below 7300 for the first time in 18 months at 7276.80, loss of 32.50 points. The broader market though was positive with 839 advances to 719 declines. The range for the series has come down to 7200-7800. 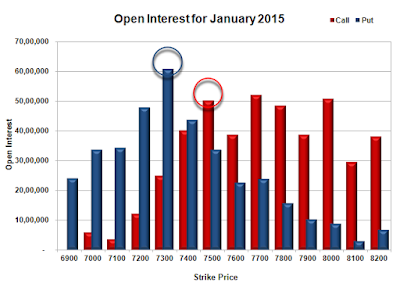 Call option 7300-7600 added 17.87 lacs OI with profit booking seen at 7700 and above strike prices. 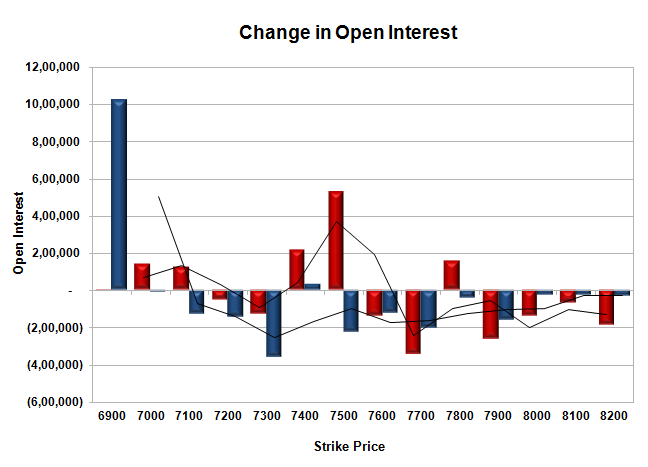 Put option 7300, 7100, 6900-6800 added 6.12 lacs OI with short covering seen at 7400 and above strike prices. Nifty Open Interest is at 1,95,51,300 down by 12,52,275, whereas Feb series added 8.79 lacs with decrease in price, probably long liquidation with roll-over. Bank Nifty Open Interest is at 28,13,370 down by 1,14,960, whereas Feb series added 0.39 lacs with increase in price, probably short covering with small roll-over. FII’s bought 1.59 lacs Futures, which includes net 6929 contracts long build-up and 575 contracts short build-up, with increase in net OI by 7504 contracts, includes 58561 longs to 52207 shorts for the day. FII’s Index future open contract as on date is 153626 Longs to 163902 Shorts, Net (-)10276 up by 6354 contracts. 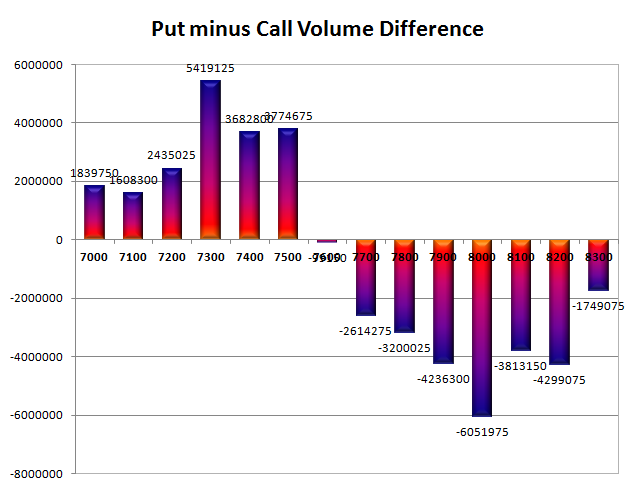 Initial and best support at 7300, with OI of 61.81 lacs and below that at 7200 with OI of 46.90 lacs. Initial resistance at 7400, with OI of 44.24 lacs and above that at 7500 with OI of 55.36 lacs. Day Range as per Option Table is 7204 - 7404 and as per VIX is 7198 - 7356 with 7341 as the Pivot. The index opened weak around 7357 and stayed weak to move below 7300 with ease and made a low of 7241 but some value buying saw the index close just above 7300 at 7309.30, huge loss of 125.80 points. The broader market was also very weak with 224 advances to 1352 declines. The range for the series has come down to 7300-7800. Call option 7200-7500 added 37.13 lacs OI with profit booking seen at 7600 and above strike prices. Put option 7200-6900 added 25.33 lacs OI with short covering seen at 7400 and above strike prices. Nifty Open Interest is at 2,08,03,575 down by 15,525, whereas Feb series added 4.97 lacs with decrease in price, probably small roll-over with huge short build-up. Bank Nifty Open Interest is at 29,28,330 up by 63,660, whereas Feb series added 0.45 lacs with decrease in price, probably huge short build-up. FII’s sold 0.17 lacs Futures, which includes net 217 contracts long liquidation and 464 contracts short build-up, with increase in net OI by 247 contracts, includes 49625 longs to 50306 shorts for the day. FII’s Index future open contract as on date is 146697 Longs to 163327 Shorts, Net (-)16630 down by 681 contracts. Initial and best support at 7300, with OI of 60.78 lacs and below that at 7200 with OI of 47.83 lacs. 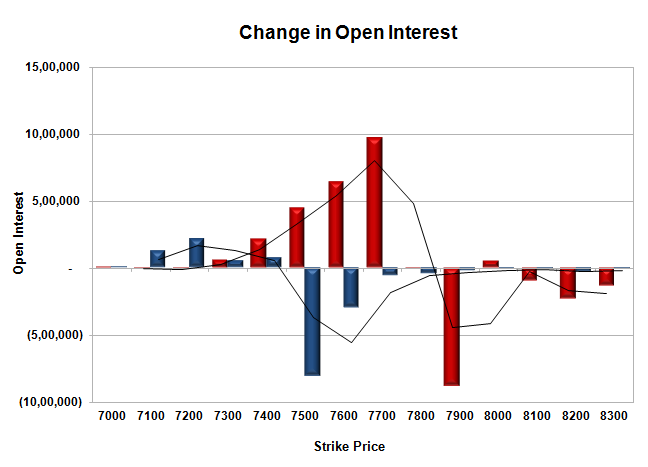 Initial resistance at 7400, with OI of 40.20 lacs and above that at 7500 with OI of 50.14 lacs. 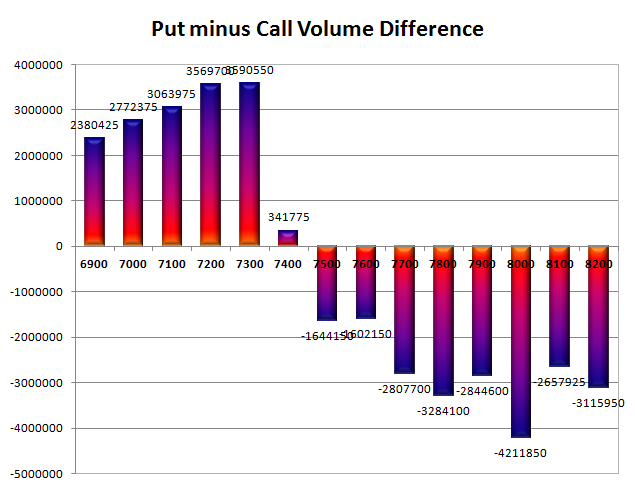 Day Range as per Option Table is 7237 - 7430 and as per VIX is 7229 - 7390 with 7341 as the Pivot. The index opened positive and saw huge short covering from the morning itself to make a high of 7462.75, but closed a bit lower at 7435.10, huge gain of 84.10 points. The broader market was also strong with 1149 advances to 428 declines. The range for the series stays at 7300-8000. 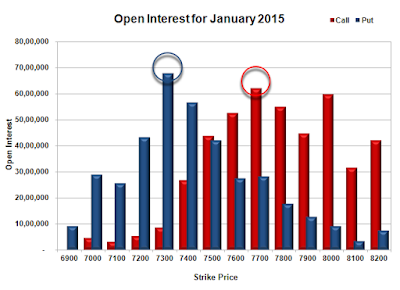 Call option 7400-7500, 7800 added 8.99 lacs OI with profit booking seen at 7900 and above strike prices. Put option 7400, 6900 added 10.56 lacs OI with profit booking seen at 7400 and below strike prices. Nifty Open Interest is at 2,08,19,100 down by 4,33,275, with increase in price, probably huge short covering. 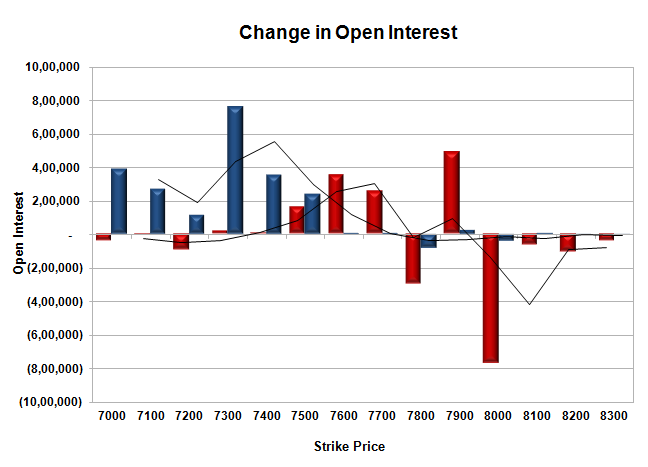 Bank Nifty Open Interest is at 28,64,670 down by 81,600, with increase in price, probably huge short covering. FII’s bought 1.82 lacs Futures, which includes net 2297 contracts long build-up and 4982 contracts short covering, with decrease in net OI by 2685 contracts, includes 43828 longs to 36549 shorts for the day. FII’s Index future open contract as on date is 146914 Longs to 162863 Shorts, Net (-)15949 up by 7279 contracts. Initial support at 7400, with OI of 56.90 lacs and below that at 7300 with highest OI of 64.25 lacs. Initial resistance at 7500, with OI of 49.09 lacs and above that at 7600 with OI of 51.25 lacs. 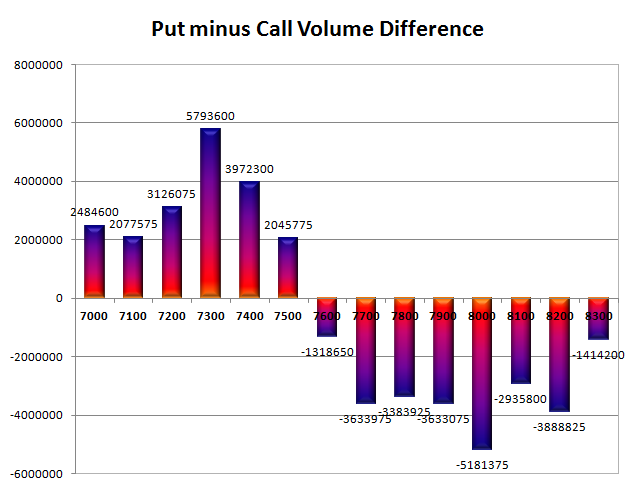 Day Range as per Option Table is 7339 - 7510 and as per VIX is 7363 - 7507 with 7421 as the Pivot. The index opened flat to negative and stayed weak for the major part of the day to close near the lows at 7351.00, huge loss of 86.80 points. The broader market was very weak with 158 advances to 1451 declines. The range for the series stays at 7300-8000. Call option 7200-7600 added huge 38.72 lacs OI with profit booking seen at 7700 and above strike prices. Put option 7400-6900 added 18.46 lacs OI with short covering seen at 7500 and above strike prices. 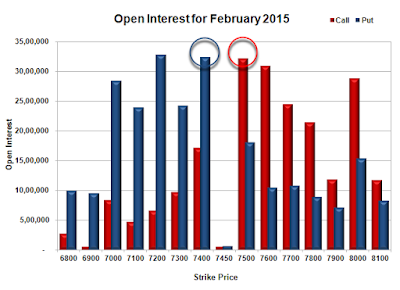 Nifty Open Interest is at 2,12,52,375 down by 13,78,725, with decrease in price, probably huge long liquidation. 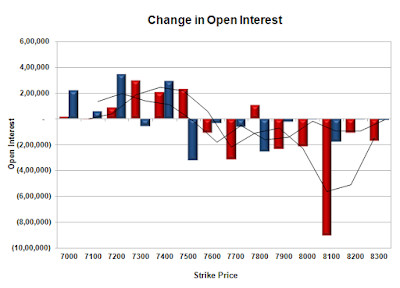 Bank Nifty Open Interest is at 29,46,270 down by 25,650, with decrease in price, probably long liquidation. FII’s bought 4.68 lacs Futures, which includes net 15087 contracts long build-up and 3620 contracts short covering, with increase in net OI by 11467 contracts, includes 45488 longs to 26781 shorts for the day. FII’s Index future open contract as on date is 144617 Longs to 167845 Shorts, Net (-23228 up by 18707 contracts. Initial and best support at 7300, with OI of 67.87 lacs and below that at 7200 with OI of 43.31 lacs. Initial resistance at 7500, with OI of 43.83 lacs and above that at 7600 with OI of 52.66 lacs. Day Range as per Option Table is 7291 - 7463 and as per VIX is 7273 - 7429 with 7384 as the Pivot. The index opened up around 7561 but after staying in a narrow range for the initial few hours saw huge selling pressure to end below 7500 for the first time in 18 months and closed at 7437.80, huge loss of 99.00 points. The broader market was very weak with 143 advances to 1450 declines. The range for the series stays at 7300-8000. Call option 7400-7700 added huge 22.74 lacs OI with profit booking seen at 7800 and above strike prices. 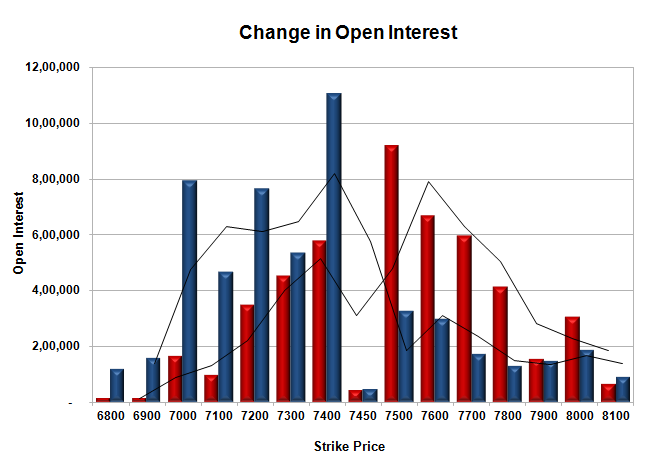 Put option 7400-7000 added 4.70 lacs OI with short covering seen at 7500 and above strike prices. 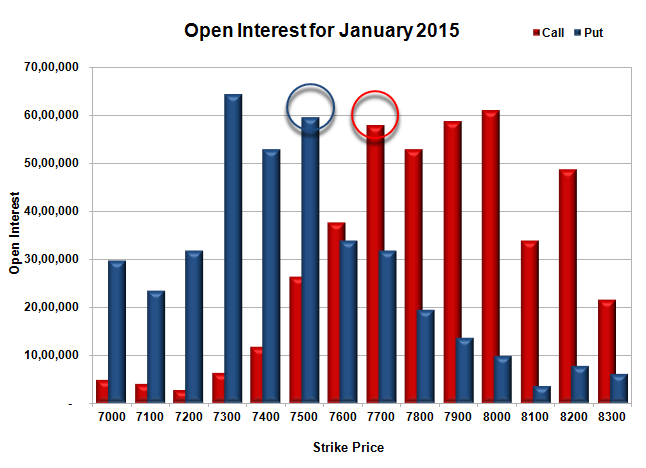 Nifty Open Interest is at 2,26,31,100 up by 2,65,500, with decrease in price, probably huge short build-up. 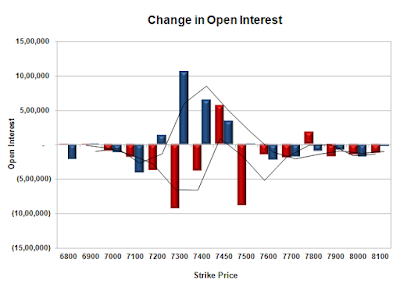 Bank Nifty Open Interest is at 29,71,920 up by 1,63,230, with decrease in price, probably huge short build-up. FII’s bought 0.84 lacs Futures, which includes net 7023 contracts long build-up and 3646 contracts short build-up, with increase in net OI by 10669 contracts, includes 37518 longs to 34141 shorts for the day. FII’s Index future open contract as on date is 129530 Longs to 171465 Shorts, Net (-)41935 up by 3377 contracts. Initial support now at 7400, with OI of 53.58 lacs and below that at 7300 with OI of 64.96 lacs. 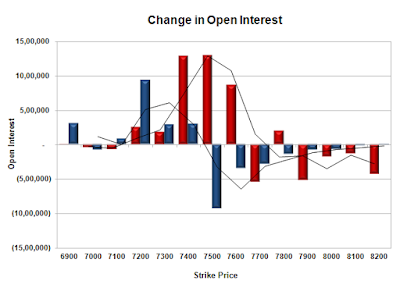 Initial resistance at 7600, with OI of 44.06 lacs and above that at 7700 with highest OI of 67.52 lacs. Day Range as per Option Table is 7383 - 7553 and as per VIX is 7362 - 7513 with 7477 as the Pivot. The index opened down by 100 points on bad global cues but saw value buying to move into positive territory but saw the sellers back to close at 7536.80, loss of 25.60 points. The broader market was weak with 382 advances to 1190 declines. The range for the series stays at 7300-8000. 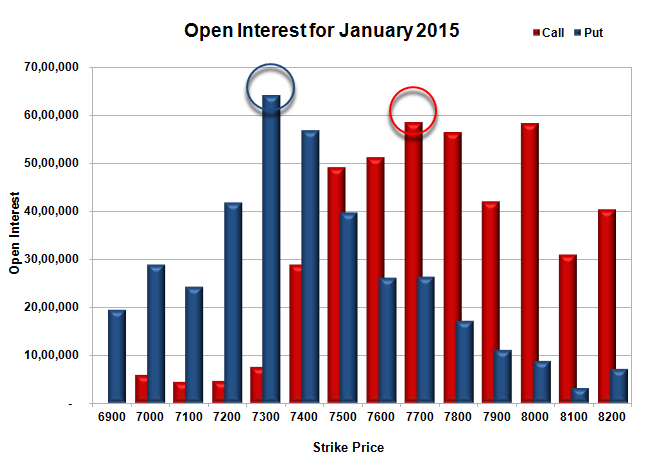 Call option 7500-7700, 7900 added 12.72 lacs OI with profit booking seen at 8000 and above strike prices. Put option 7500-7000 added huge 21.43 lacs OI with short covering seen at 7800 and above strike prices. Nifty Open Interest is at 2,23,65,600 up by 1,58,625, with decrease in price, probably huge short build-up. 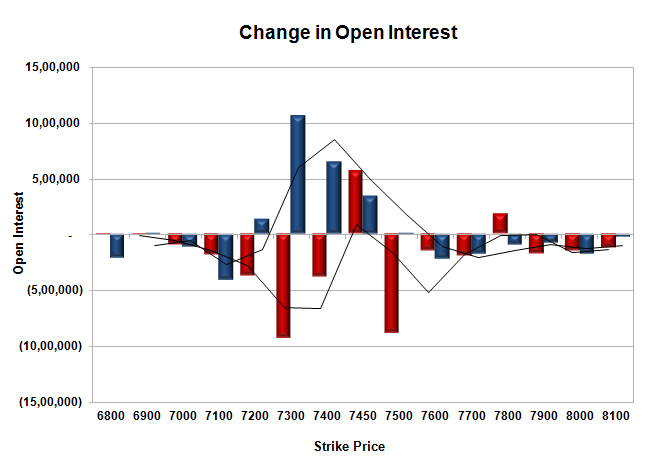 Bank Nifty Open Interest is at 28,08,690 up by 74,610, with decrease in price, probably huge short build-up. FII’s sold 0.37 lacs Futures, which includes net 1836 contracts long build-up and 3316 contracts short covering, with increase in net OI by 5152 contracts, includes 35798 longs to 37278 shorts for the day. FII’s Index future open contract as on date is 122507 Longs to 167819 Shorts, Net (-)45312 down by 1480 contracts. Initial support stays at 7500, with OI of 59.48 lacs and below that at 7400 with OI of 52.87 lacs. 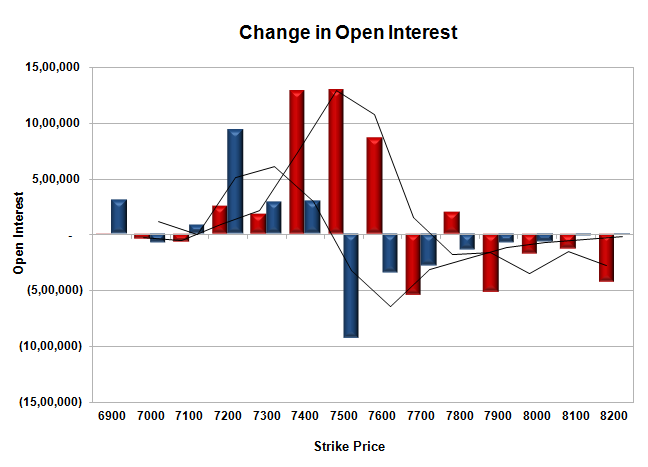 Initial resistance at 7600, with OI of 37.64 lacs and above that at 7700 with OI of 57.83 lacs. Day Range as per Option Table is 7449 - 7614 and as per VIX is 7463 - 7610 with 7528 as the Pivot. The index opened positive around 7558 and up towards 7600 only to be sold off to the panic lows at 7425.80. Value buying/short covering saw the index back in green to close at 7562.40, gain of 52.10 points. The broader market though was weak with 298 advances to 1293 declines. The range for the series stays at 7300-8000. 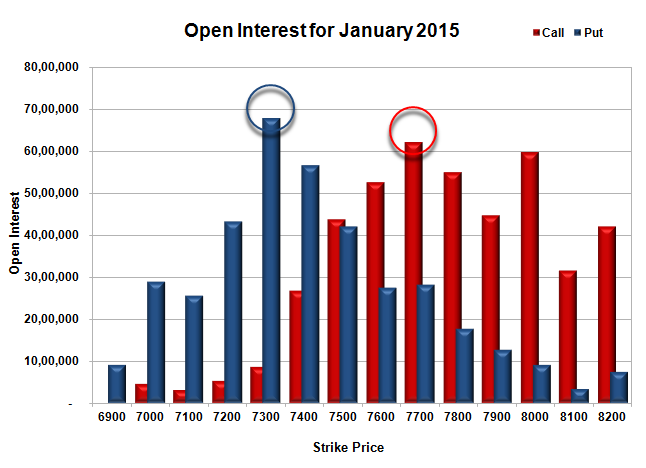 Call option 7200-7500, 7800 added 9.13 lacs OI with profit booking seen at 7600 and above strike prices. 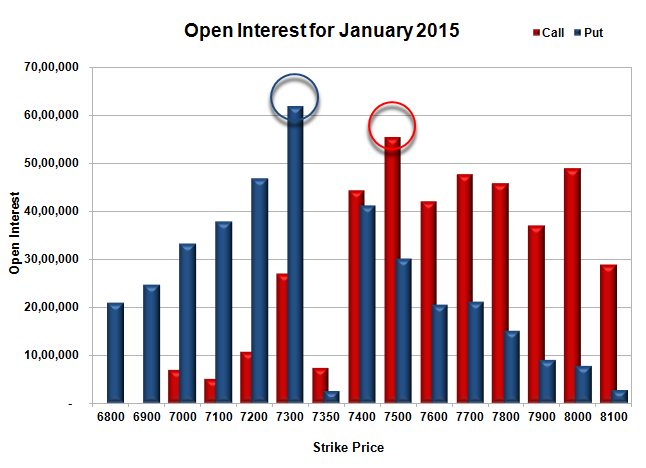 Put option 7400-7000 added 8.46 lacs OI with short covering seen at 7500 and above strike prices. 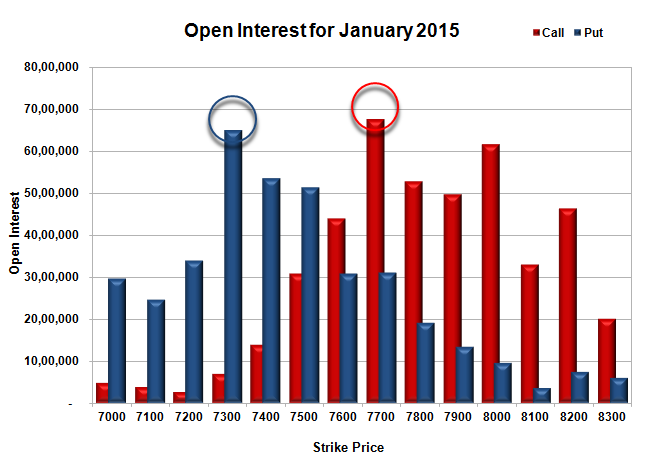 Nifty Open Interest is at 2,22,06,975 up by 4,13,550, with increase in price, probably huge long build-up. 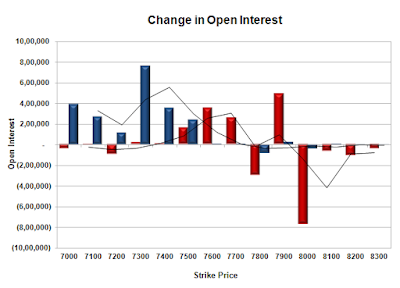 Bank Nifty Open Interest is at 27,34,080 down by 1,59,540, with increase in price, probably huge short covering. FII’s bought 1.57 lacs Futures, which includes net 3025 contracts long build-up and 3255 contracts short covering, with decrease in net OI by 230 contracts, includes 45755 longs to 39475 shorts for the day. 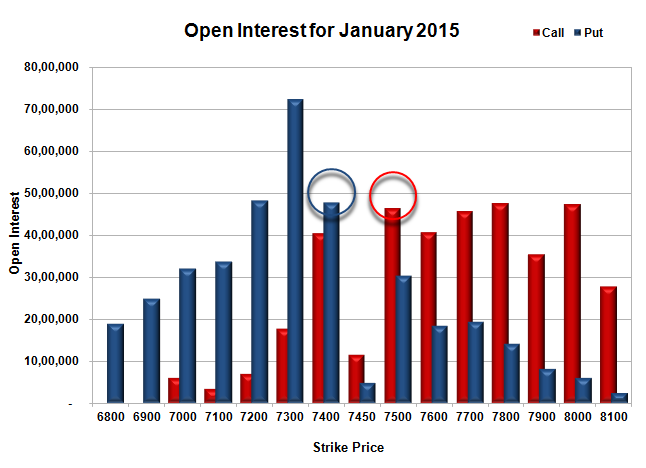 FII’s Index future open contract as on date is 120671 Longs to 164503 Shorts, Net (-)43832 up by 6280 contracts. Initial and best support at 7500, with OI of 57.04 lacs and below that at 7400 with OI of 49.32 lacs. Initial resistance at 7600, with OI of 34.09 lacs and above that at 7700 with OI of 55.25 lacs. Day Range as per Option Table is 7459 - 7614 and as per VIX is 7460 - 7614 with 7526 as the Pivot. The index opened positive around 7587 but saw huge sell-off from the morning itself to move below 7500 but closed just above at 7510.30, loss of 53.55 points. The broader market was weak with 436 advances to 1135 declines. The range for the series stays at 7300-8000. 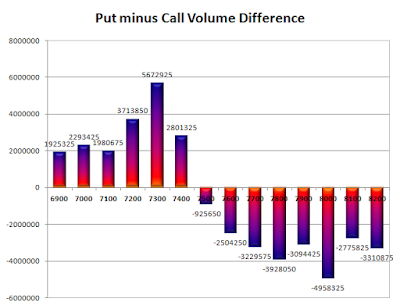 Call option 7200-8000 added huge 25.48 lacs OI with profit booking seen at 8100 and above strike prices. 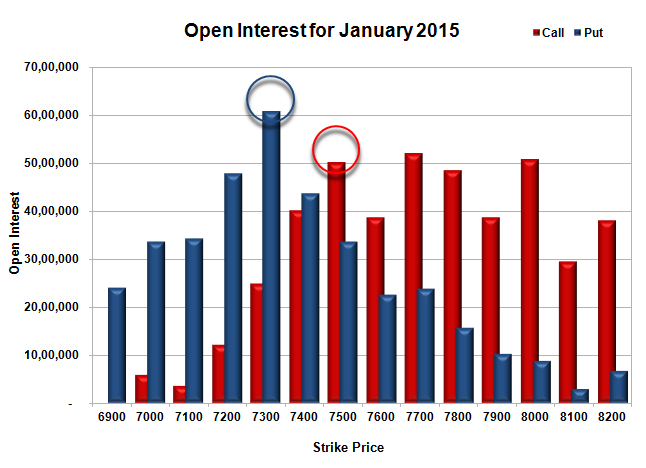 Put option 7500-7200, 7000 added 8.78 lacs OI with short covering seen at 7600 and above strike prices. 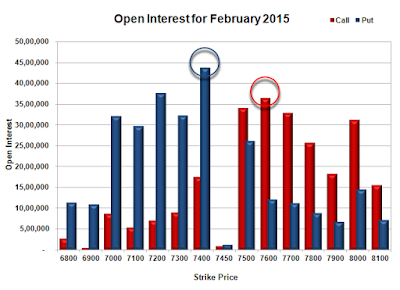 Nifty Open Interest is at 2,17,93,425 down by 1,70,850, with decrease in price, probably huge long liquidation. Bank Nifty Open Interest is at 28,93,620 up by 3,91,920, with decrease in price, probably huge-huge short build-up. 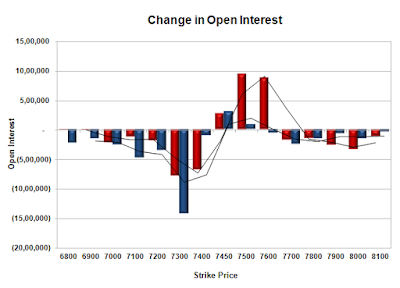 FII’s sold 1.05 lacs Futures, which includes net 1485 contracts long build-up and 5693 contracts short build-up, with increase in net OI by 7178 contracts, includes 27037 longs to 31245 shorts for the day. FII’s Index future open contract as on date is 117646 Longs to 167758 Shorts, Net (-)50112 down by 4208 contracts. 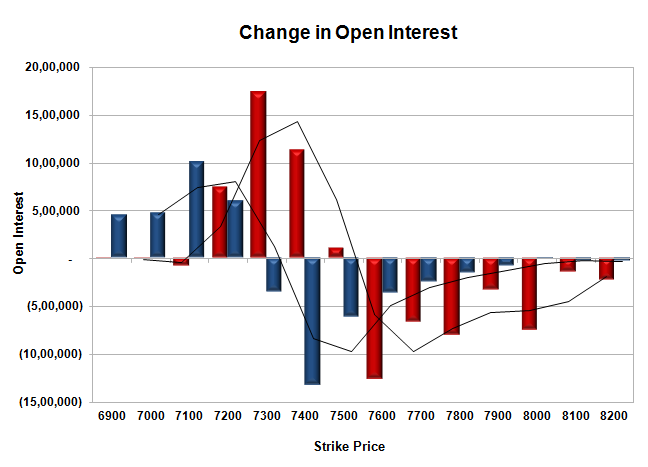 Initial and best support still at 7500, with OI of 60.27 lacs and below that at 7400 with OI of 46.43 lacs. 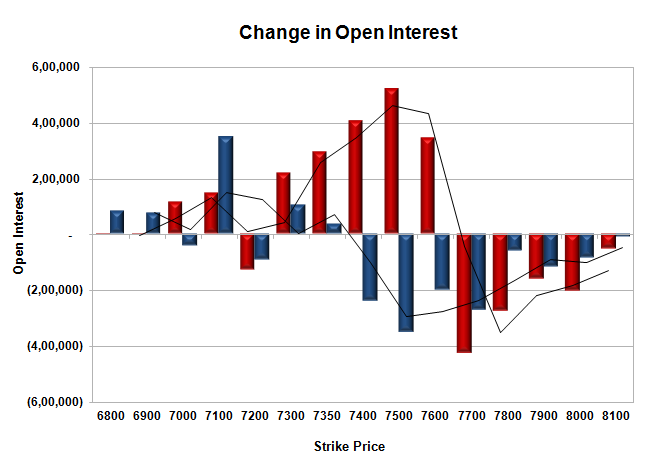 Initial resistance at 7600, with OI of 35.20 lacs and above that at 7700 with OI of 58.44 lacs. 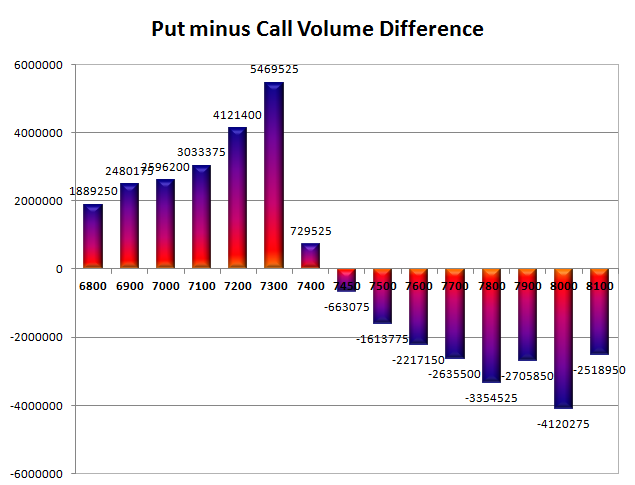 Day Range as per Option Table is 7455 - 7596 and as per VIX is 7437 - 7584 with 7529 as the Pivot.